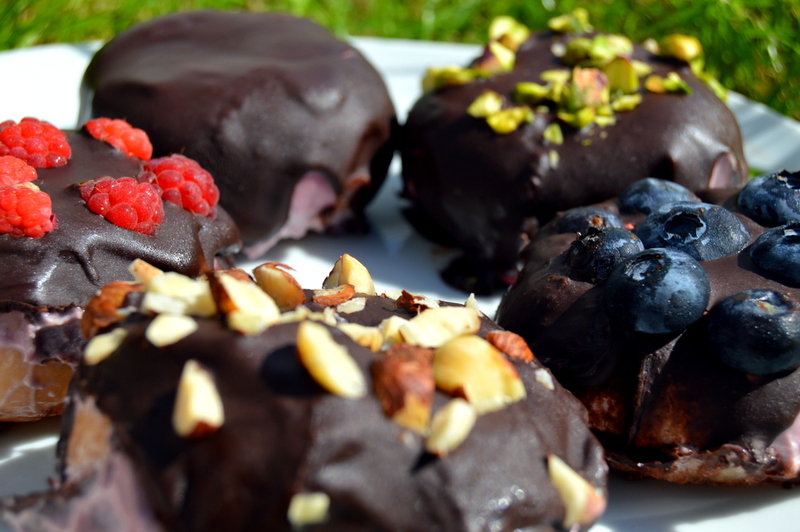 This recipe for healthy raspberry chocolate doughnut peaches is easy and fun. The peaches have a chocolate shell and a thick layer of raspberry cashew cream. They are vegan, gluten-free and healthy. They do contain a tablespoon of date syrup but this can be replaced with any liquid sweetener like maple syrup or left out if you like it less sweet. I’m using an 80% dark chocolate to cover the doughnut peaches as I like the bitterness with the sweet fruit. However you can use any chocolate for the glaze. Doughnut peaches are only in season for a short time during the summer. They can also be called Saturn peaches. Once they are ripe enough the stone should just push out. Doughnut nectarines work just as well. Push out the stone and peel all of the peaches, make sure to not break the fruit. Put peaches in the freezer for about 30 minutes. Push the raspberries through a sieve using a wooden spoon and collect all the raspberry juice. Melt the coconut oil / cream. Blend together the raspberry juice, cashews, date syrup, vanilla and melted coconut until smooth. Pour the raspberry cream into a bowl and cover each peach with it. Then place on a non stick sheet in the freezer for 30 minutes. Melt the chocolate then spoon it over each peach until they are covered. Put back on non stick sheet in the fridge. Enjoy immediately or store in the fridge where they will last a couple of days. You can make a raw food version of this by mixing 1/3 cacao, with 1/3 coconut oil and 1/3 sweetener for the chocolate shell. 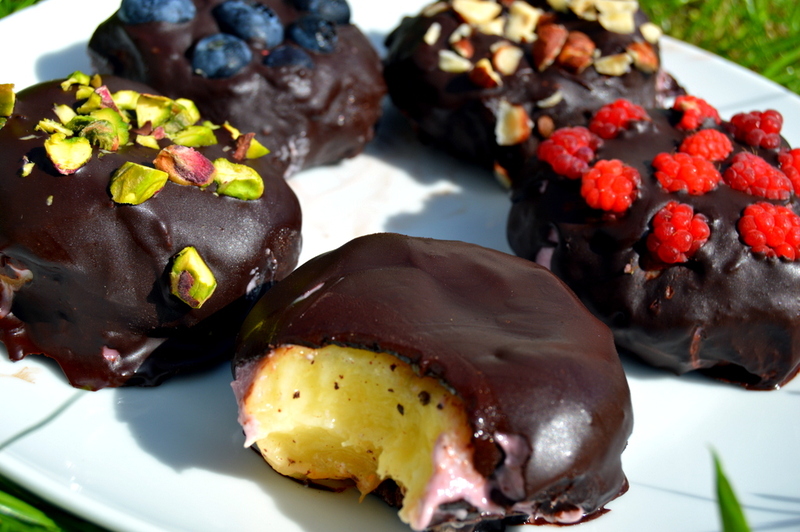 I usually make the raw food version but for the video I use a bar of very dark chocolate to make it more accessible. Top with anything you like – I just used an assortment of colourful fruit and nuts to make them visually appealing. 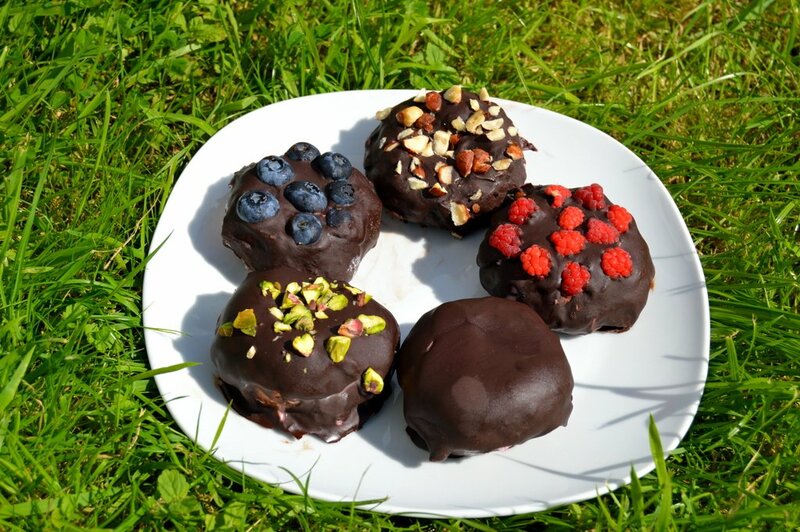 What can be easier than using an actual doughnut peach to make this gluten, flour and egg free doughnuts? They are of course not deep fried and free of any transfats.